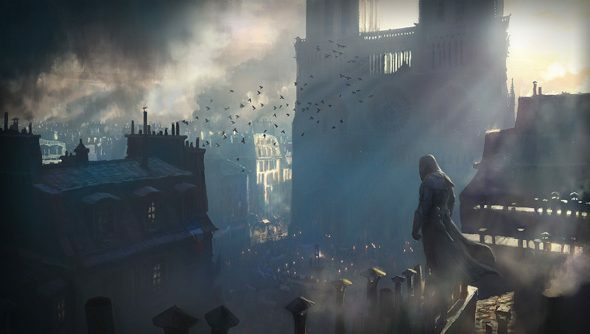 Notre Dame turns out to be one of the better Assassin’s Creed missions: one of those that dress you only in the figleaf of an objective, and offer plenty of ways at it. Ubisoft Montreal say all assassinations in Unity will be structured this way – within a mission type the studio have now codified as ‘black boxes’. Ubisoft do a nice line in dramatically-voiced lead developers. Today’s is Alex Amancio, creative director of Assassin’s Creed: Unity. His intense French-Canadian narration would be a good fit for Arno. In Amancio’s GamesCom demo, our assassin protagonist discovers his chosen method of killing and a means of entering the cathedral by fulfilling optional side missions. The developer says the route he eventually chooses is just one of 10 possible entrances. Black box missions will change depending on the tasks players complete during their course, and the result should be a “personalised experience” even within the broader, linear narrative. Also glimpsed are the new parkour moves (bum sliding is in! ), and a toggled stealth mode that grants Arno the “silence and agility of a predator”. And Assassin’s Creed: Unity’s Paris, it’s becoming rapidly apparent, is a wonder. Are you the least bit interested in Assassin’s Creed: Rogue with all this going on? Perhaps you’re pining for solid pine ships?